NEW YORK — Chase, Capital One and Wells Fargo recently released data showing how each company faired during the full-year and fourth-quarter. In each company's respective report, executives took time to discuss the performance of their auto finance segments. 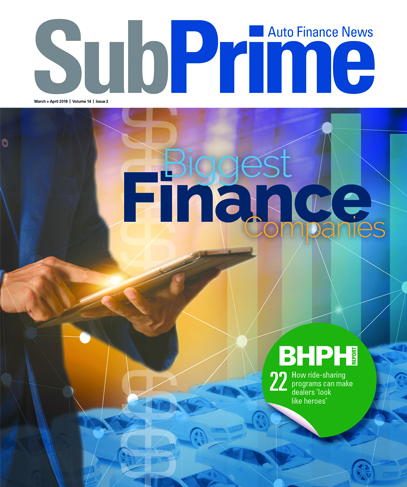 As results from larger, national players can in some ways be indicative of how the market is performing as a whole, SubPrime Auto Finance News reviewed all three reports and culled out the details specific to the auto finance industry. The auto finance segment of Capital One posted annual net income of $233.5 million, up $101.4 million, or 76.8 percent, from $132.1 million in 2005. Meanwhile, net income for the fourth quarter came in at $33.7 million, compared to $8.1 million in the same period of 2005 and $35.3 million in the third quarter of 2006. "The auto finance segment reported a solid quarter as it continues to gain scale and grow originations by taking advantage of its multichannel, full-credit spectrum strategy," executives explained in their annual report. As of Dec. 31, managed loans were $21.8 billion, up $5.4 billion, or 32.9 percent, from the previous year. "The managed charge-off rate decreased to 2.85 percent in the fourth quarter of 2006 from 3.32 percent in the fourth quarter of 2005 because of a mix shift towards lower-risk borrowers from the acquisition of Hibernia in 2005," officials reported. Furthermore, the company said the managed charge-off rate grew from 2.34 percent in the prior quarter due mostly to seasonality. Capital One Auto Finance recently partnered with AutoTrader.com to provide an online finance tool and resource to help consumers. Moreover, the company said its new Tulsa loan-servicing center has already hired 200 professionals. Under the new deal inked with AutoTrader.com, Capital One will be featured on AutoTrader.com to offer consumers the opportunity to easily secure a new loan on a vehicle or refinance a currently owned vehicle. Officials said consumers can apply for Capital One's no-obligation Blank Check program via the AutoTrader.com site and should receive a response within 15 minutes of submitting an application online. Those who qualify for financing may receive the funding as quickly as the next day, executives noted. Furthermore, AutoTrader.com said it will offer a Monthly Payment Calculator to help consumers decide just how much vehicle they can afford to purchase while still remaining within a certain budget. "AutoTrader.com is dedicated to providing the best resources to our consumers to assist them with the car-shopping process," said Chip Perry, president and chief executive officer of AutoTrader.com. "Capital One is a highly respected financial institution that consistently delivers flexible financing options to meet each car buyer's respective needs in today's evolving automotive marketplace," he continued. Ryan Schneider, president of Capital One Auto Finance, added, "Capital One is committed to empowering consumers by combining an easy loan process, great service and low rates. The combination of AutoTrader.com's resources with our no-hassle auto loan experience is a win-win for consumers." Capital One Auto Finance is moving quickly to hire 450 new staff members by the end of the year, and 600 over the next three years, Dave Lawson, executive vice president of Capital One and CEO of Capital One Auto Finance, confirmed in a recent report. As part of this expansion, Capital One said it has already hired 200 people for its new Tulsa loan-servicing center. "We've reduced the work force at one of our other facilities, so we're looking forward to growing the Tulsa location," Lawson said. The company's facility in Foothills Ranch, Calif., recently received employment cuts when officials decided to transfer some jobs to lower-cost areas such as Tulsa. The Tulsa location is fairly new, as it just opened in October of last year. The company said it selected the site in the Verizon campus of Cherokee Industrial Park after a nationwide search. Officials also confirmed that the collections and inbound customers categories of the new loan-servicing center are already fully operational. Finding the 200 staff members to fill the empty seats at the location has taken "some work," according to Lawson, even though the company has received a lot of applicants. "We're after the best associates we can get, so we put them through a testing program," he explained. Lawson went on to say that the Tulsa location's goal is to have the highest-performing center in the Capital One system. "They're well on their way to that," he pointed out. "It's going to be a horse race." The company also reported it has completed renovations for its 90,000-square-foot space on the Verizon campus. "The second level is one of the nicest customer service sites I've ever seen," Lawson said. Capital One said it plans to continue hiring collections and customer service agents, and will promote internally to fill manager positions as they become available. Officials said the company is accepting applications at www.capitalone.com/careers. The auto finance division of Chase reported net income of $65 million, which was down $6 million from the prior year. However, net revenue came in at $411 million, up $43 million from 2005. Officials explained that the 12-percent jump in net revenue was a reflection of higher vehicle auto operating lease revenue and wider loan spread on lower loan and direct finance lease balances. "The provision for credit losses of $97 million increased by $26 million, primarily the result of a change in the timing of recognition of bankruptcy-related credit losses for auto loans," executives said. Non-interest expense of $207 million was up $27 million, or 15 percent, from the previous year, which the company attributed to depreciation expense on owned vehicles subject to operating leases. Commenting on the company's overall results, Jamie Dimon, chairman and chief executive officer, said, "The firm is focused on driving improvement in performance through both continued cost discipline and investment in all areas of our franchise, converting and integrating The Bank of New York branches, and completing the wholesale deposit conversion, which is the last significant integration activity related to the Bank One merger." Wells Fargo Financial, which covers consumer loans primarily through real-estate secured debt consolidation products, auto finance, consumer and private-label credit cards, in addition to commercial services to consumers and businesses, reported net income of $865 million for the year, up from $409 million in 2005. Net income for 2005 included incremental losses driven by the change in bankruptcy law — a first quarter $163 million charge in 2005 to conform Wells Fargo Financial's charge-off practices with Federal Financial Institution Examination Council guidelines, and $100 million (pretax) for estimated losses from Hurricane Katrina. Officials said net income for 2006 included a $50 million (pretax) release of provision for credit losses reversing the remaining portion of the provision for Hurricane Katrina. Moreover, the company said revenue in this segment grew 16 percent for the year, hitting $5.43 billion, compared with $4.68 billion in 2005. As for the provision for credit losses, officials said it was $1.3 billion for the year, down from $1.49 billion in 2005. Discussing the segment's results, Tom Shippee, Wells Fargo Financial's president and CEO, said, "Wells Fargo Financial completed another strong year, with record net earnings to go along with continued refinement of our business model. We successfully completed a number of strategic initiatives that make us better positioned to serve the financial needs of our customers. "For example, in the past year we combined our auto lending and consumer lending stores in the U.S. into a single-store network, and we integrated all of Wells Fargo's indirect auto lending operations in the U.S. and Canada into one full-spectrum automobile lending business," he added. Shippee went on to say that, "During the fourth quarter, we continued to focus on reducing losses and delinquencies in our auto lending business by improving processes and staffing levels in collections. As a result, our auto growth slowed as expected in the fourth quarter." Commenting on credit quality, Mike Loughlin, Wells Fargo's chief credit officer, reported, "As expected during the fourth quarter, the auto loan portfolio continued to post losses at elevated levels, although compared with the third quarter, losses in that category were essentially flat. "During the fourth quarter, we continued to hire and train new collectors and contracted with external collections vendors to increase capacity," he said. "We also adjusted account acquisition strategies to reduce new loan volumes, particularly in higher-risk tiers. We anticipate these actions will stabilize losses in early 2007 and lead to improved loss rates. "We monitor vintage credit performance to identify potential adverse credit or economic trends. We saw higher delinquency and losses in recent auto vintages consistent with industry-wide experience. We did not see any material deterioration of any vintages, including the most recent vintages in other consumer portfolios, such as credit cards or home equity," Loughlin concluded. Wells Fargo Auto Finance recently announced the recipients of its Stagecoach Dealer of the Year Awards for 2006. Kristy Moskal, representing DeSimone Suzuki in Philadelphia, said, "Wells Fargo has been our full-spectrum lender for quite some time. I've had a fabulous relationship with all of my contacts from each department whether it has been my analyst, my rep., or my funder. "The people who represent Wells Fargo really are a great team who work hard to ensure that we, as a dealership, are valued to them," she added. Gary Lorenz, president of Wells Fargo Auto Finance, said, "Our Dealer of the Year award winners exemplify the types of relationships we strive to have with every one of our dealers. We sincerely appreciate them, and we remain steadfast in our commitment to meeting their needs. "The Dealer of the Year Award is our way of recognizing and saying thank you to our dealer partners for their outstanding efforts throughout 2006," he continued. Company officials said the top dealers are selected from among 21,000 dealerships throughout North America. One dealership from each of the 54 sales regions is selected annually to receive the award. The Dealer of the Year Award recipients are presented a handmade model stagecoach and a Wells Fargo Visa gift card to recognize their accomplishments, executives said. Bill Heard Chevrolet — Columbus, Ga.
Bill Heard Chevrolet — Union City, Ga.